In company-owned rabbit-hutch apartments live tenants who can’t afford to live anywhere else, and the apartment complex in which high-school girl Hatsumi Narita lives is ruled over by the rumor mongering, self-righteous Mrs. Tachibana. Get on Tachibana’s bad side, and life becomes hell. When Hatsumi has to buy a pregnancy test because her popular sister Akane is late, Mrs. Tachibana’s son, Ryoki, who used to bully Hatsumi as a kid, promises not to tell the world about Hatsumi’s secret, only if she becomes his slave. Suddenly Azusa, Hatsumi’s protector in their youth, reappears to save her again. He’s moving back into the neighborhood. Despite the budding romance between Hatsumi and Azusa, Ryoki has control over her through the secret that could ruin the lives of everyone in Hatsumi’s family, and he hasn’t forgotten who his slave is. If you like insane characters, this will be for you. If I’d read an overview, I probably wouldn’t have picked it up. It’s not just some light-hearted shojo—it gets sexual fast. With push/pull relationships—not just metaphorically—it’s a wonder this girl doesn’t just shove her slutty sister under the bus. The whole being forced into slavery—the extent of which is never really explained—confused me at first. It just didn’t seem like something a teenage boy would come up with. But then again, Ryoki’s mind was more than a little twisted. Constantly telling Hatsumi that she was stupid, Ryoki was hardly likeable as the love interest. Not that he had much going for him besides his looks anyway. Ordering someone around, treating them like property, it just wasn’t the way to make them like you. Azusa—aka, the other side of the love triangle—was much Ryoki’s complete opposite. Caring, chivalrous and…well, okay, he’s the cover model for a magazine, so that didn’t hurt things either. Even if you’re not into love triangles, it doesn’t necessarily matter. These aren’t your regular cut and dry characters, like I said—they’re insane. It’s all about deception. With enough of it going on, there’s barely room left to keep things straight in your head. Unrequited crushes rule, with just about every character longing for someone who’s longing for someone different. It only seems to be the pushy ones that get what they want…well, most of the time. I love seeing characters crash and burn—and with this type of story, there are plenty of opportunities for that. Throughout these first three volumes, my allegiances have shifted, then shifted again, and I think I’m well and truly confused as to who I’m rooting for. Their lives are such a mess, but I can’t look away. In terms of the art, I can’t really say whether it’s world class as of yet. Maybe once I’ve read a greater variety of manga I may form an opinion. The pictures did make me smile, laugh, stare in shock…basically everything they were meant to. If you’re after some eye candy, there was certainly plenty of that. Fans on Nana might like this. Hatsumi reminded me of Hachi-Nana’s flighty nature and indecisiveness. I freaking hate this series. I’m sure I’ve ranted about it somewhere (maybe on Goodreads). 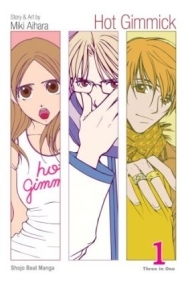 One other manga series I now can’t stand is Absolute Boyfriend (Zettai Kareshi). I don’t read much manga anymore (nor do I watch much anime) but I really like slice-of-life like Yotsuba&! and Usagi Drop.